Inspiring connection, embodiment, and devotion to the self through mindful movement. Both subscriptions start with a FREE 7-day trial! Our Seasonal Mat Subscription gives you great workouts relevant to the season, including tips on form and fun variations, so you can find and feel the deep core work that helps you connect with your true core self, and move with ease. Bonus “treat” - instructor’s choice! With our Wunda Chair Subscription, Brooke will lead you through challenging full-hour Wunda Chair workouts that leave you feeling like a super hero! Great for devoted practitioners and Pilates instructors who have a Wunda Chair. This subscription brings you challenging, effective, and dynamic workouts on the chair full of variations and modifications to suit any body. Full of form tips and cues that you can apply to your own workout as well as bring into your instruction! Regardless of your training or your brand of chair, these workouts will inspire you. Be the first to know about the latest updates on the Wunda Chair subscription! 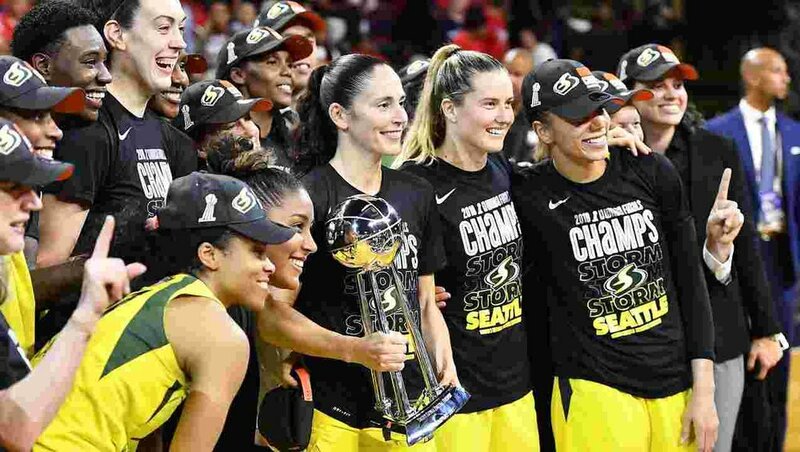 Brooke Tyler is the official Pilates Instructor of the WNBA 2018 champion team - Seattle Storm! This is the subscription exclusively created for the team members of the Seattle Storm. Brooke makes custom workouts for the team as well as for individual players like Breanna Stewart and Sue Bird. Check out the team! Working with athletes is one of Brooke’s passions! If you are an athlete or athletic trainer interested in working with Brooke, contact us! We offer a few classes for individual purchase. Try these to get a taste of the full subscription, or in addition to it! These classes never expire - purchase once and press play as many times as you like! Pop in your email address to get CoreSelf updates, tips, and useful fun stuff about health, Pilates, and wellness! Spam is a drag, and we're into upliftedness. In other words, we respect your privacy and your inbox. So we'll never give away, sell, rent, lend, or otherwise share your email address. Thank you, and welcome to our email list! We'll be in touch once a month or so. We hope you'll write us back sometime if you have anything to suggest or ask!